Spaceport America dons its costume for the "After Earth" science fiction film press junket on May 17, 2013. The New Mexico spaceport is the homeport for real-life private space travel by Virgin Galactic's SpaceShipTwo, which plans to launch from the site soon. TRUTH OR CONSEQUENCES, N.M. — The chopper descends towards a giant runway surrounded by scrubby, red earth of the New Mexico desert. 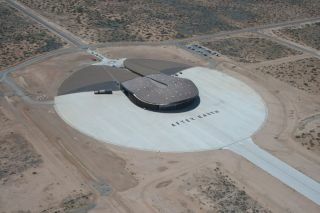 At the center sits a hangar as big as a city block that looks like the launching pad for an alien fleet. I've flown to Spaceport America, planet Earth's first commercial space tourism outpost, for a press junket for the new science fiction film "After Earth." The spaceport, located nearly a mile above sea level in the desolate New Mexico desert, may not be open for suborbital spaceflight yet, but is hosting private events. Stylists, producers, Studio reps and the movie's screenwriters mill about as members of the press nibble on food and wait to speak with "After Earth" stars, Will and Jaden Smith. Despite the army of movie people in the building, it looks empty, like hosting a small barbecue on a football field. The spaceport itself is nearly complete and is waiting for its anchor partner, the space tourism company Virgin Galactic, to complete flight tests of the private SpaceShipTwo spaceliner, said Aaron Prescott, the business operations manager for the facility. In late April, the debut SpaceShipTwo broke the sound barrier during its first rocket-powered test flight. Virgin Galactic plans to build a fleet of SpaceShipTwo vehicles, each capable of carrying six passengers and two pilots, to launch customers on thrilling rocket rides to the edge of space and back. In a recent press interview, Sir Richard Branson, the head of Virgin Galactic, said he plans to be on an inaugural flight this Christmas, Prescott said. The Spaceport is located in the isolated desert because the region sees 340 days of clear skies each year and is in close proximity to the White Sands Missile Range, which has restricted airspace. That means spaceflights launched from here wouldn't have to share the skies with Earth-bound commercial planes. As a result, the Spaceport has built massive amounts of infrastructure, from roads to electricity to sewer lines, to a 1.3 million-gallon tank of water to douse potential fires. "We built a small city in the desert," Prescott said. "After Earth" stars Will and Jaden Smith pose for a photo at New Mexico's Spaceport America during the press junket for their science fiction film on May 17, 2013. NASA astronauts train for years to get the chance to enter space, but once the facility is open, private space travel enthusiasts with money to burn ($250,000 to be precise) would be able to fly to space after completing three days of training to prevent them from blacking out or "throwing up on everybody," Prescott said. Depending on demand, passengers may leave for space every month to every day. And while costs may start high, Prescott thinks Spaceport will help bring the cost of sub-orbital travel way down. "What we want is the democratization of space," Prescott said.